It sure is. Thank you, sir. 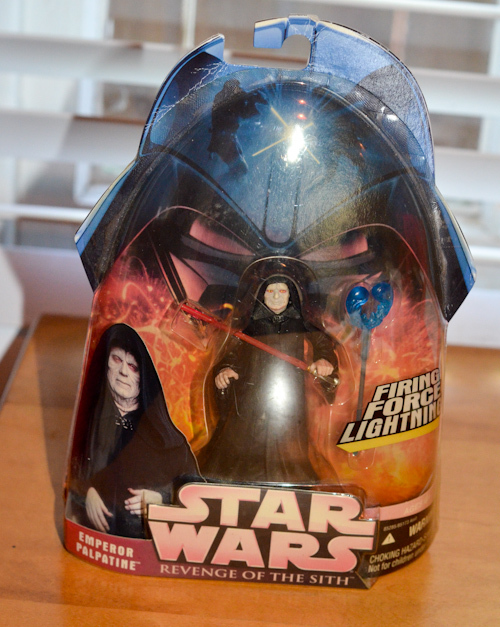 Thanks for allowing me the opportunity to be able to participate in your (Rafflecopter Test) Giveaway for the Palpatine Action Figure! Let me know how Rafflecopter works. A lot of the Mom giveaway bloggers are using it, but my issue is that there are SO many steps that you take to enter. Are people going to do that many steps? I entered … I think. I don’t have a Google+ profile and I don’t want one. So, I did not do that part. Am I still entered? @Ronald – thank you and good luck! @Jeremy – I agree, interested to see the relationship between size of the prize and number of steps. Seems like it could be used for very simple ones as well – just enter your email address and name and go, people just aren’t using it that way. @Sandy you are entered! Other than the first one, each of the other steps are optional, and increase the number of entries you get but are not required. Thanks for helping out and good luck! It would make a great stocking stuffer! Merry Sithmas! I won’t have to owe you for the shipping, will I, if I win? Nope, no cost to the winner, Jerry. Only his or her dignity, which is the cost for proudly displaying an action figure. Interesting app. Rafflecopter seems like an interesting product. I’m not sure how I feel about it. It was simple enough to go through though. I toss my hat into the contest to see if I can win one for my kid. Very cool and different giveaway! Has a winner been chosen yet? I assume I didn’t win because I never received an email saying so. Merry Christmas!